Architect and artist Petteri Nisunen spoke to Grand Tour at the WDC 2012 Summer Pavilion in Helsinki. The wooden pavilion designed by Alvar Aalto for the 1956 Venice Biennale has been completely restored, now housing an exhibition showing highlights in cutting-edge wood technology used in contemporary architecture. A satellite event of the World Design Capital, the exhibition introduces recent constructions from Helsinki through architectural models, as well as the Kilden Theatre from Kristiansand. Wood certainly looks like a beautiful alternative to concrete. Although Aalto always used wood in furniture design, the pavilion in Venice is a rarity for its building material. With unusual constructivist inspired shapes, the form was a quickly thought out experiment. The white rectangles on the sides are actually trusses that hold the entire structure together. Initially designed as a pop-up gallery space, with the support and enthusiasm of Aalto’s great patron Maire Gullichsen, the pavilion is now a permanent fixture in the Giardini. It is an interesting experiment within Aalto’s oeuvre. This is the last week of the 2012 Architecture Biennale. 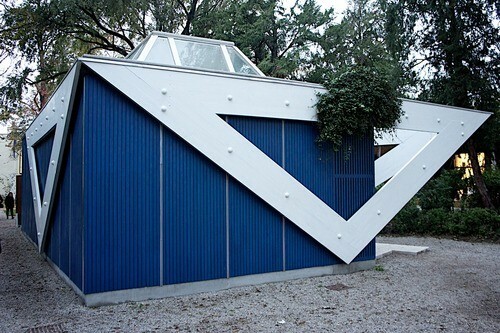 For its higher location , the Giardini has not been affected by the recent flooding in Venice.